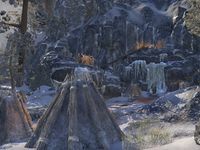 King-Chief's Throne is a Riekr camp north of Orsinium. It is the home of King-Chief Edu, a tamed Riekr who escaped into the wild and assembled a Riekr army. Kill King-Chief Edu 10 Kill the Riekr regent King-Chief Edu at the King-Chief's Throne. Monster Hunter of the Month 15 Complete 30 group boss daily quests in Wrothgar.